In 2006, approximately 195,827 veterans were homeless on a given night-an increase of 0.8 percent from 194,254 in 2005. More veterans experience homeless over the course of the year. They estimate that 336,627 were homeless in 2006. Veterans make up a disproportionate share of homeless people. They represent roughly 26 percent of homeless people, but only 11 percent of the civilian population 18 years and older. (Please see Oldtimer’s comment on these numbers below before you repeat them.) This is true despite the fact that veterans are better educated, more likely to be employed, and have a lower poverty rate than the general population. A number of states, including Louisiana and California, had high rates of homeless veterans. In addition, the District of Columbia had a high rate of homelessness among veterans with approximately 7.5 percent of veterans experiencing homelessness. They estimate that in 2005 approximately 44,000 to 64,000 veterans were chronically homeless (i.e., homeless for long periods or repeatedly and with a disability). This estimate was calculated with 2005 veterans data from the CHALENG data set and 2005 tabulations of Continuum of Care (CoC) point-in-time counts.The CoC counts do not differentiate between adults and children, so in the number provided here-percent of homeless people who are veterans-the denominator includes some people under 18. If children were taken out of the 744,313 total, veterans would make up a larger percentage of the homeless population. This suggests that 26 percent is a conservative estimate. Either way, this estimate falls within the bounds of past research.Rosenheck (1994) reviewed research studies and found that between 29 and 49 percent of homeless men are veterans. 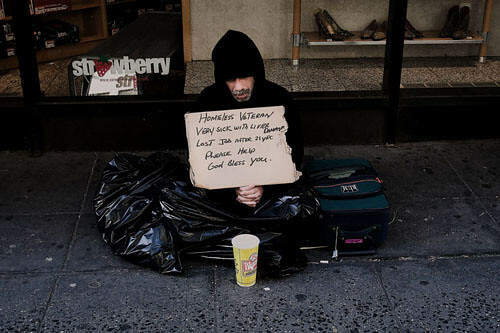 HUD’s recent Annual Homelessness Assessment report (2007) puts the percentage of homeless veterans at 18 percent; however, 35 percent of the cases in this data source were missing, making the estimate highly unreliable. The Rosenheck estimate range includes the 43% that I had independently found. The basis data for my findings are here. The National Alliance to End Homelessness has an interactive map that show veteran homelessness by state. Click on the map to activate it, then your cursor will bring up data for each state as you hover over it. It is interesting to note that Washington DC has the highest percentage of veterans that are homeless, more than double the rate of any other state at a whopping 7.51%. Other high percentage states are Louisiana, California, Oregon, Nevada, Connecticut and North Dakota in that order. The highest number of homeless veterans are in California with more than 49,000 homeless, followed by New York, Florida and Texas in that order. Lack of affordable housing is the primary driver of homelessness. The 23.4 million U.S. veterans generally do not have trouble affording housing costs; veterans have high rates of home ownership and appear generally well housed. However, there is a subset of veterans who have severe housing cost burden. ■ We estimate that nearly half a million (467,877) veterans were severely rent burdened and were paying more than 50 percent of their income for rent. ■ More than half (55 percent) of veterans with severe housing cost burden fell below the poverty level and 43 percent were receiving foods stamps. 4■ Rhode Island, California, Nevada, and Hawaii were the states with the highest percentage of veterans with severe housing cost burden. The District of Columbia had the highest rate, with 6.4 percent of veterans paying more than 50 percent of their income toward rent. ■ Female veterans, those with a disability, and unmarried or separated veterans were more likely to experience severe housing cost burden. There are also differences by period of service, with those serving during the Korean War and WWII more likely to have severe housing cost burden. ■ We estimate that approximately 89,553 to 467,877 veterans were at risk of homelessness. At risk is defined as being below the poverty level and paying more than 50 percent of household income on rent. It also includes households with a member who has a disability, a person living alone, and those who are not in the labor force. Physical Health and Disability: One out of 10 veterans is disabled and many suffer from physical disabilities, oftentimes caused by injuries in combat. (…) The number of disabled veterans is increasing with more than 20,000 veterans suffering from wounds in Iraq and Afghanistan. Weak Social Networks: (…) Veterans have low marriage rates and high divorce rates and, currently, one in five veterans is living alone. (…) Social networks are particularly important forthose who have a crisis or need temporary help. Without this assistance, they are at high risk for homelessness. I hope you can sleep well tonight after reading these statistics and findings. I know that I won’t. I also know the homeless heroes sleeping in the bushes, alleys, behind dumpsters, in doorways, and in the woods or on mountain sides are not going to sleep as well as they could if we could only get our government to respect and support our troops when they come home. and it is so very cold!